Our National Auto Data file provides information on millions of car and truck owners throughout the US. The data is collected from multiple sales and auto-service transaction sources that are truly multi-sourced, and updated monthly. All data we collect is fully compliant with the Drivers Privacy Protection Act (DPPA) and Shelby Act. The National Auto Data file is perfect for reaching qualified auto owners with relevant & timely marketing offers. And, for improving the quality of current automotive lists with hygiene and enhancement services. Get FREE instant access to the auto data now by visiting the industry’s most powerful automotive count system. Or, let us know what you’re looking for by clicking here and we’ll work together to get you connected to the right data. Reaching vehicle consumers at the right time is critical to maximizing your marketing ROI. As consumers go through the stages of buying a new/used car, or automotive service, they leave indicators that we can use to qualify them beyond geography and demography. Whether you’re utilizing a saturation strategy or highly-targeted conquest/loyalty strategy, our data gives you a variety of consumer and auto selects that provide the insights you need to reach the right consumer at the right time. We can help you identify and reach vehicle owners who are actively shopping for a new car. Pulled from a data sub-set of more than 10MM records–looking at a 30-day activity history–the True In-Market™ auto data is only available through National List Services. We know how impactful it is to your automotive marketing to know when a consumer purchased their vehicle, and whether it was new or used. These auto selects are now available on our National Auto Data file. 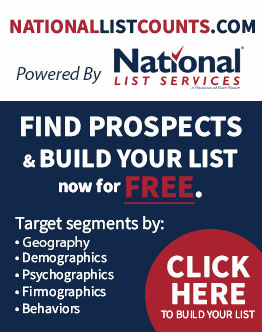 Find auto prospects & build your lists now for FREE. Automotive owner information changes frequently. Out-of-date data wastes effort, increases marketing costs, and decreases response rates costing you valuable customers and future revenue. High quality data maximizes the potential of your database and gives you accurate insights for creating effective marketing campaigns by understanding and anticipating the needs of your customers. Maintaining your list data is an integral part of maximizing the return on your marketing dollars and involves very little effort. Give us a shout to learn more about our data hygiene services and how we can help you maintain the highest quality data. Power your conquest, loyalty, and buy-back marketing campaigns with valuable insight provided through our data enhancement services. First Direct’s data enhancement solutions enrich your database with data appends that add greater detail about your customers to help you target them more effectively. We retrieve information from multiple data sources which results in the highest quality data available. Need help getting started? Let us know what you’re looking for.